Bill Clinton loved a Big Mac and fries but it looks like Hillary is a fan of burrito bowls and beans. 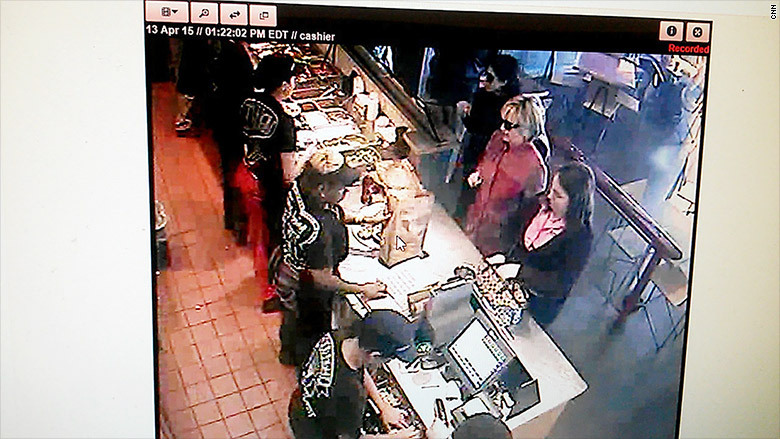 On her first full day campaigning for the White House, Hillary Clinton made an incognito visit to a Chipotle (CMG) in Ohio. The stop made headlines because the former First Lady went unrecognized by customers and was only picked up by surveillance cameras. 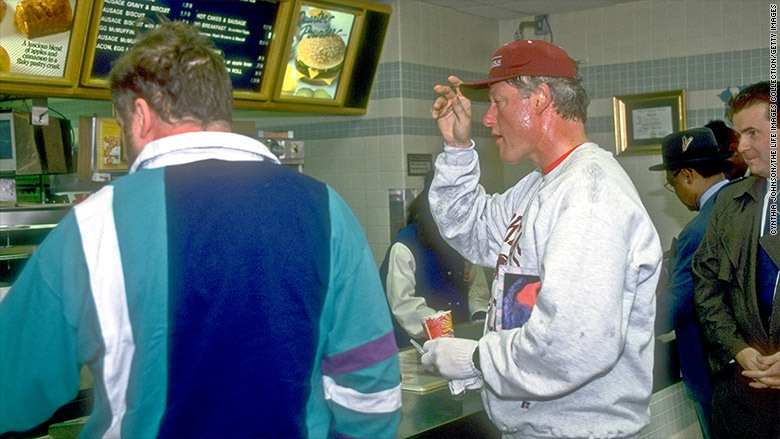 There are countless pictures of Bill, short shorts and all, stopping by McDonald's (MCD) in the 1990s. 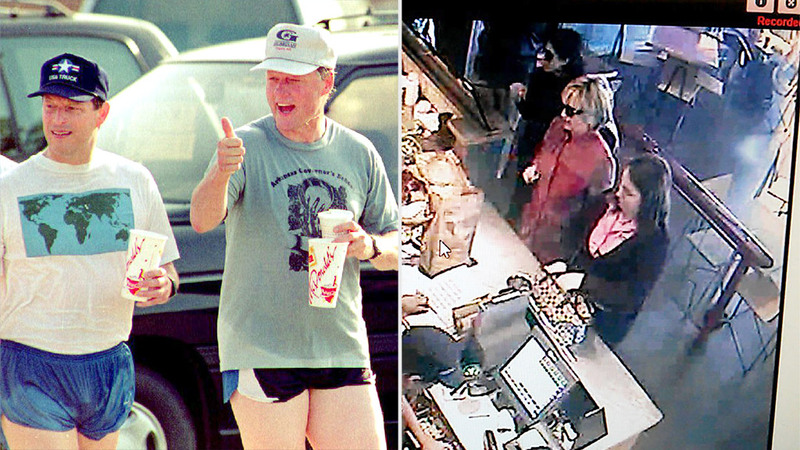 But Hillary's trip to Chipotle says more than just a little something about her dietary habits. In many ways, it's a sign of the times -- both in presidential politics and the dining world. Chipotle is a fast-growing juggernaut that is a favorite of investors and millennials, the prized demographic that restaurants and presidential campaigns alike are fighting over. 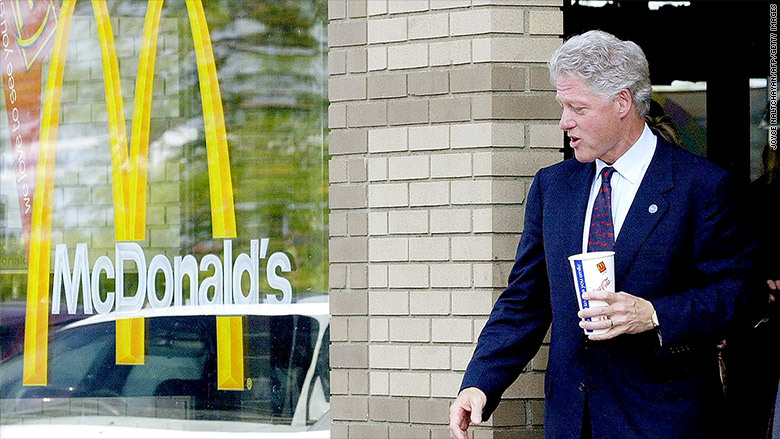 McDonald's, much like the short-shorts Bill wore on the campaign trail in the early 1990s, looks outdated. The burger chain -- which once owned Chipotle -- is suffering from shrinking sales as millennials and others defect for healthier, fresher alternatives. Millennials love Chipotle: One of the biggest obstacles Hillary has to overcome is the perception that she represents the past. The same message would have been conveyed by a trip to Shake Shack (SHAK), Panera (PNRA) or other restaurants perceived as cooler or offering higher quality food. If she was on the West Coast, a trip to El Pollo Loco (LOCO) would have done the trick as well. But Chipotle was the perfect fit. A consumer survey commissioned by Morgan Stanley led the bank to conclude that Chipotle is the "unequivocal favorite among millennials." This key age group is less likely to recommend fast food to friends and family, recommending McDonald's the least, the survey found. Not loving it: The iconic burger joint suffered a 15% decline in profits last year as sales declined for the second year in a row. 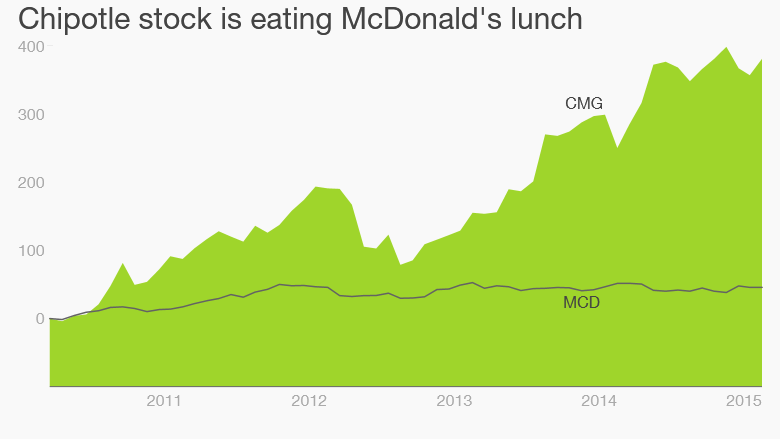 No wonder why McDonald's is racing to turn things around. The fast food giant named Steve Easterbrook its new CEO earlier this year, charging him with improving the company's brand, customer service and food quality. Recent moves include cutting back on chicken raised on antibiotics and adding sirloin burgers that are served on cutting boards to signal freshness. One analyst even reported that McDonald's soon plans to roll out kale as an ingredient. Chipotle is a hot stock: But McDonald's needs a lot more than kale to get Wall Street hungry for its shares again. While Chipotle shares have skyrocketed 458% over the past five years, McDonald's is up just 41% over that span, badly trailing the S&P 500. Not even a McDonald's campaign stop by Hillary Clinton will fix that stock chart. CNNMoney correspondent Cristina Alesci contributed to this report.